I recently came across a few old photographs and press cuttings which my reader may find amusing. This cutting is from the Nottingham Evening Post, circa 1960. Second from left is Ken Scholes, I believe, who wrote for Harry Stanley’s Unique Magic Studio and The Gen. I’m third from left, with hair. 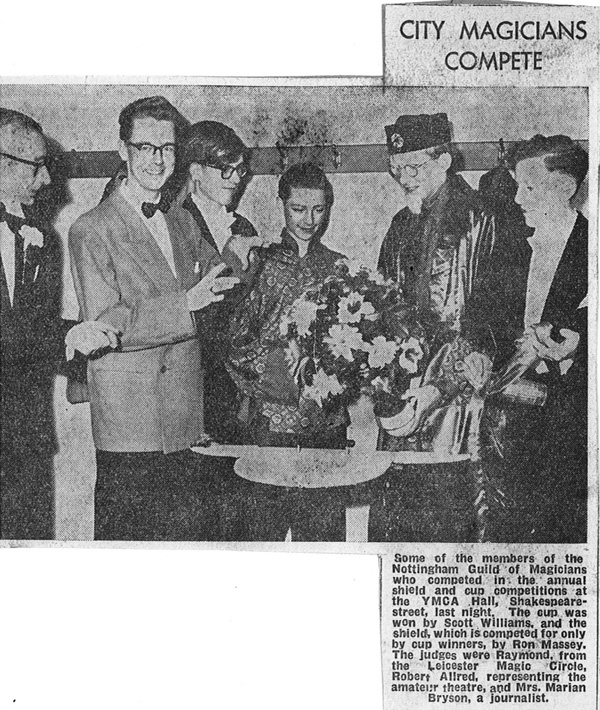 The guy in Chinese costume is Ron Massey and on the right is fellow Long Eaton Grammar School student Allan Falconer, now Director of Corporate Outreach and Professor of Geography at George Mason University in Fairfax, Virginia, USA. I have a list of local magicians. Best if you could ring me during opening hours: 0114 276 0482 with more details.